Our local vendors put the vision, commitment, and hard work into growing and handcrafting the delicious foods we offer at the Durham Co-op Market. So when it comes to cooking mouthwatering meals made with healthy, affordable, and fresh ingredients, we turn to the experts that love their products and know how to make the most of them. Try out this recipe from Firsthand Foods, our primary supplier of sustainable meats, made with locally sourced chorizo and organic zucchini (both currently on sale). Try it out, and let us know what you think! Slice each zucchini in half lengthwise. Using a grapefruit spoon, scoop out the seeds and make a trough for the filling. Set aside. Place a skillet over medium-high heat and add 1 tbs. olive oil. Add the chorizo and cook until browned. Drain and set aside. Add 1 tbs. olive oil to the same skillet and sauté the onion and red pepper for about 5 minutes or until translucent and soft. Add garlic and smoked paprika. Sauté for 1 minute. Reduce temperature to medium and add the chorizo and diced tomatoes. Cook for an additional 5 minutes. Fill each zucchini halve with the chorizo mixture. Place on a cookie sheet. 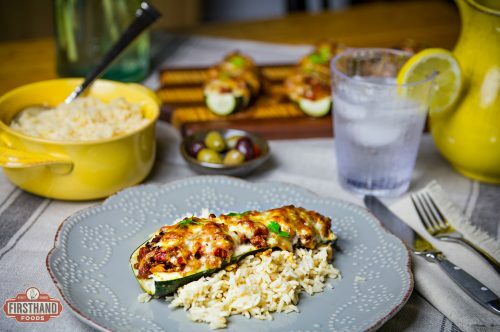 Top each zucchini with Monterey Jack cheese and bake for 30-35 minutes or until zucchini is fork tender.